Wouldn't it be nice if buyers volunteered to pay businesses a fair price for what they are offered? Seems like a silly idea! But recent business experiences and research suggest we may just be stuck in the mind-set of the last century. "Modern" mass-market commerce is a race to the bottom that assumes and appeals to the worst in people. Sellers set prices as high as they think they can to maximize total profit -- so buyers' only option is to take it, or bargain-hunt. What we have here is what behavioral economists call an exchange relationship norm. Exchange norms are zero-sum, quid-pro-quo. As described in other posts, FairPay seeks to find a better way. 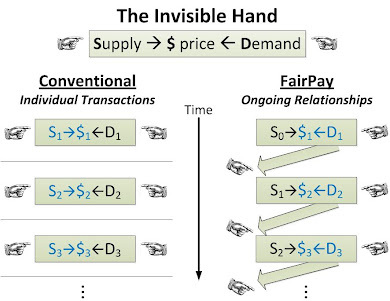 How to understand the power of FairPay was made a bit clearer to me in a very interesting research paper by Santana and Morwitz, "We’re In This Together: How Sellers, Social Values, and Relationship Norms Influence Consumer Payments in Pay-What-You-Want Contexts." That paper suggests an interesting two dimensional behavior model, which I interpret as follows. Social Value Orientation (SVO), essentially pro-social versus pro-self, as individual traits. Economic/Exchange Relationship Norms versus Communal Relationship Norms, as situational variables in a relationship. Segment customers based on their Social Value Orientation traits -- are they receptive to and driven by social values, or not? Tactics for managing the FairPay process will be a bit different for high, medium, and low SVO trait segments. Nudge all customers toward Communal Relationship Norms, in ways tuned to each segment -- to seek to bring out their Social Value Orientation to the fullest extent possible. 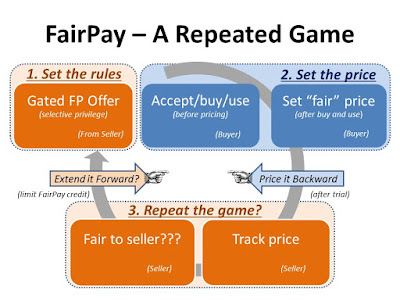 Based on this, the FairPay process diagram can be understood to work for each segment, but with rather different control parameters applied to each. In all cases the objective is to foster a situation that favors Communal Relationship Norms, and that draws out whatever level of Social Value Orientation can be elicited. The sweet spot is targeting high Social Value Orientation (pro-social) customers, and moving them toward Communal Relationship Norms. They are the ones who will respond best to the pricing privilege that the seller grants to the buyer in FairPay -- to price in a way that considers fairness to the seller -- and who will be least inclined to abuse that privilege. Managing that for these buyers will be mostly carrot, and not much stick. The secondary focus is on moving medium-to-low Social Value Orientation (more pro-self) customers toward Communal Relationship Norms. They will need more nudging to emphasize the carrot (why the seller is deserving of communal norms), while keeping the stick in sight (why it is in their best interest to price fairly). Those who do not respond with at least minimum levels of fairness (uncooperatively pro-self) can be treated as a third segment -- to be excluded from FairPay (at least until they seem ready to behave more sociably), and be left to buy on the conventional set-price terms that routinely work for pure Exchange Relationships. Sustain that positioning throughout their customer relationships. This is deeply embedded in the FairPay processes. Seek to market to high SVO (pro-social) customers as the preferred market segment. This is the segment that will be most willing to pay you generously for your product or service (if you position yourself as deserving, and ask in the right way). Manage the segmentation throughout the business processes to appeal in the right way to the right people. FairPay provides an architecture that supports this. In contrast, freemium has been very popular because of its crude segmentation between those who pay and those who don't, but has been found to be limited in managing to optimize and up-sell that. 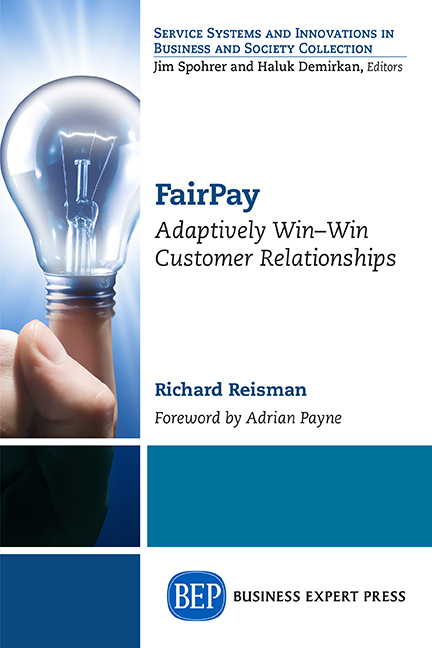 A further insight from this study is to reinforce that the nudging of buyers in the adaptive control process of FairPay is best done with a gentle hand. Communal Relationship Norms are a delicate thing. There is an inherent quid-pro-quo in FairPay -- in the future, those who do not pay well will get fewer and less generous offers than those who do pay well. But this should be managed with enough flexibility and forgiveness of minor lapses to not poison the effort to nudge toward Communal Relationship Norms. This research helps to clarify the behavioral principles that underlie FairPay, and reinforce expectations that it can work very effectively over a wide range of customers and product types. It provides a perspective to better understand my other posts on the motivations, mechanics, and benefits of FairPay. "People who are motivated to maximize their own gain irrespective of others’ gain are labeled as individualistic. Those who are motivated to maximize the relative difference between their own gain and that of others are said to be competitive. Those who seek to maximize joint gains for self and others are labeled as cooperative, and those who are motivated to maximize gains for others are said to be altruistic....SVO research tends to focus on cooperative, individualistic, and competitive orientations or the more general distinction between pro-social (i.e., cooperative and altruistic) and pro-self (i.e., individualistic and competitive) orientations...We argue that pro-socials will be more likely to take the seller’s welfare into consideration than pro-selves. However, we expect this payment behavior to vary according to the salience of relationship norms between the buyer and the seller when the pricing decision is made..."
"Consumers can form relationships with brands that mimic social relationships with other people...As such, these brand relationships are guided by norms in the same way as individual relationships...Perhaps the most common distinction among relationship norms is the exchange / communal norm distinction...Exchange norms are typically based on economic factors, while communal norms are based more on social factors. In general, exchange relationships are guided by norms of quid-pro-quo, where partners provide benefits either in response to benefits given or with the expectation of getting similar benefits returned in the near future. Conversely, communal relationships are governed more by norms of conferring benefits to the partner...Keeping track of inputs and outputs, comparable benefits, and repayment behavior are all hallmarks of exchange relationships; while helping others, keeping track of others’ needs, and responding to others’ emotional needs are all hallmarks of communal relationships. Business partners and acquaintances are typically guided by exchange norms, whereas friends and family are typically guided by communal norms." "...These findings demonstrate that relationship norms affect consumer behavior, and although commercial relationships are typically governed by exchange norms, that buyer-seller communal norms are possible. We extend these findings to the PWYW context by suggesting that relationship norms can affect how much individuals pay in such settings. Specifically, when an exchange norm is salient versus a communal norm, consumers will be less likely to consider social factors in generating their purchase price, resulting in lower payments and a lower likelihood of overpayment."